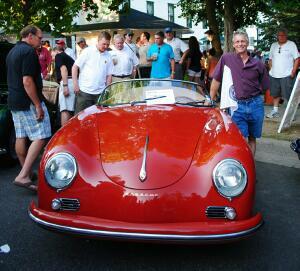 he completed on a customer's 356. Story details below. Porsche Parade, the annual gathering of the members of Porsche Club of America, is under way now -- the first week of August -- in Savannah, Ga. We hope there are a few Milwaukee Region members at Parade to represent our region and enjoy the camaraderie of this event that attracts PCA members from across North America. We have plenty of region activities coming up for all members. Check out the details for the upcoming autocross, the monthly Cars & Coffee gathering in Lake Mills, the Milwaukee Masterpiece, dinner at Mader's (lederhosen optional) and more. Aug. 4 – Board meeting. Wisconsin Club Country Club, 6200 W. Good Hope Rd. Members are always welcome to sit in on these meetings. Bring your ideas to the board for their consideration and/or action. Aug. 7 – Cars & Coffee. The monthly gathering of fine automobiles in Lake Mills at 2Shores International. Details here. Read about the July event here. Great pictures! Aug. 21 – Autocross at Miller Park. This is the final autocross event of the season that will be hosted by our region. Check it out. You can have great fun in your Porsche while driving a low speeds through a cone-defined course. Details here. Aug. 27 - Dinner at Maders. Our host is Kim Zinda. This is on the Saturday evening of the two-day Milwaukee Masterpiece, a premiere car show at the lakefront. Join us for dinner after enjoying the Masterpiece or just come for dinner. Details about the dinner here. Aug. 27 - 28 - Milwaukee Masterpiece at Milwaukee's Lakefront. Details here. Sept. 1 - Board meeting. Members always welcome to join in the discussion about region events. Sept. 10 - Fall Tour. Save the date. More details to come on this annual driving event on some of Wisconsin's great roads. This will be a half day tour. Sept. 17 – Dinner at Timmers. This is a social gathering. Our hosts are Sharon and Paul Stewart. Details here. Oct. 16 - Drive to breakfast. Our host is Al Wagner. Save the date. More details available in the September newsletter and online. The drive will start in Mequon and end in Delafield where we'll enjoy breakfast together. Oct. 20 - Dinner at Tony & Mia’s in Delafield. This is a Thursday evening. Our host is Bob Shellman. Join us for dinner at one of Delafield's newest restaurants. Details about this event here. Note, an RSVP and deposit is required by Oct. 10. Oct. 14 - 16 Rennsport Reunion. Read the details of this unique gathering here. Milwaukee Region member Dave Zimmer earned national recognition at the 2011 Road&Track concours d'elegance. Read the details here. 31 years - Thomas J. Kurey Jr. Here's a recap of some of the events that region members have enjoyed recently. July 3 Cars & Coffee. The July 3 Cars & Coffee attracted a variety of exotic foreign cars and several examples of American muscle. Read about the event here. July 3 Autocross at Miller Park. Check out the action here. Thanks to Ron Pace for the photos. July 16 Kohler International Challenge and the Road&Track concours d'elegance. Al Wagner hosted a drive to Elkhart Lake so that region members could enjoy the annual Road&Track concours d'elegance on the streets of Elkhart Lake, along with dinner at the Lake Street Cafe. At nearby Road America that same weekend, the annual Kohler International Challenge was under way, offering the finest in vintage racing. Read the details of our region's event here. Check out the latest classifieds online here. Thanks to members who find interesting and sometimes wierd news and articles about Porsche. This month's contributors include Paul Roller and Mike Wiviott. 928 revival rumors. Is Porsche bringing back the 928? Read on. Video test drive of the new 911GTS. The Wall Street Journal's automotive section features this video about Porsche. Check it out. GT2 climb up Pike's Peak. Great sound and video of a GT2's run up Pike's Peak. Check it out. LEGO Porsche? Yes, you read that right. Someone built a Turbo Cab with Lego's. No expensive oil changes required for this Porsche. Details here. Porsche wins J D. Power award for 7th consecutive year. Read on. ATLANTA -- June 30, 2011 -- Porsche returns to Le Mans with a works-run LMP1 sports prototype. The first outing of the completely new developed race car is planned for the year 2014. With 16 overall victories, Porsche is the most successful manufacturer in Le Mans. 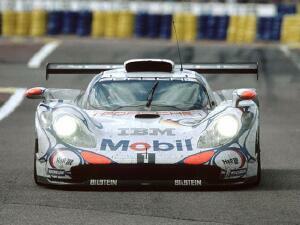 The most recent win was in 1998 with the Porsche 911 GT1. Hans Herrmann and Richard Attwood claimed the first overall victory for Porsche in 1970 with the legendary 917 short-tail. The 16th and by now last overall win was secured by Laurent Aiello, Stéphane Ortelli and Allan McNish in 1998 with the 911 GT1. In the years 2008 and 2009, the Porsche RS Spyder sports prototype won the title in the LMP2 category. Web site design and maintenance by SVJ Designs, LLC. All graphics, layout, and structure of this service (unless otherwise specified) are Copyright © 2006-2019, SVJ Designs, LLC.